In the brand new year of 2017, we are pleased to announce the new partners of Sun Ten global distribution to our worldwide customers. In Australia, we have the new sole distributor of “ Sunlife Tree Private Limited”, while “ Apollo Therapy & Reflexology Parnell Limited” will offer the exclusive distribution service in New Zealand. 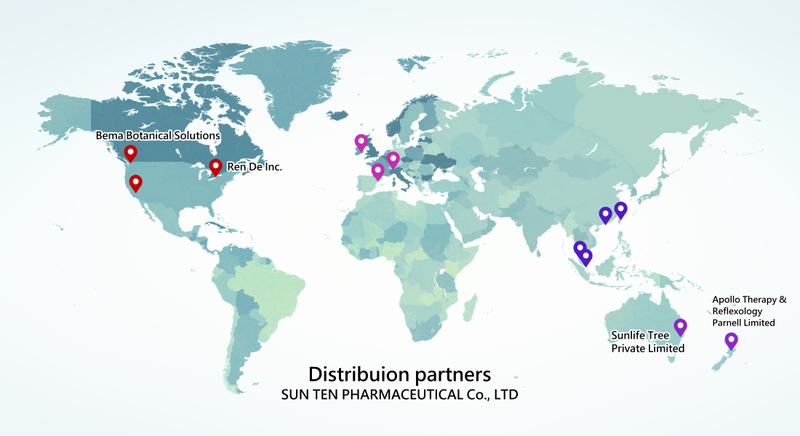 To strengthen the distribution network in Canada, Sun Ten Laboratories signed up a new distributor of “ Ren De Inc.” to offer the service in Eastern Canada, while“ Bema Botanical Solutions ”will keep on serving the needs in the Western Canada. Sun Ten will continue to build up a better global distribution service network and we are confident that our first-rate local service will continue to grow. We also look forward to working together with our global partners to expand our faith of “quality for life” to the world. You are receiving this email because of your relationship with SUN TEN PHARMACEUTICAL CO., LTD.. Please reconfirm your interest in receiving emails from us. If you do not wish to receive any more emails, you can unsubscribe here.